1 of 7 Separate eggs, placing whites in large bowl and yolks in medium-size bowl. Let warm to room temperature. 2 of 7 Heat oven to 350 degrees F. Coat 15 x 10 x 1-inch jelly-roll pan with nonstick cooking spray. Line pan with parchment or waxed paper; coat paper with spray; dust with flour. 3 of 7 Sift together flour, 1/4 cup cocoa powder, cornstarch, cinnamon, baking powder, baking soda and salt into a bowl. 4 of 7 Beat egg whites at high speed until soft mounds form. Gradually beat in 1/2 cup sugar, 2 tablespoons at a time, until stiff, glossy peaks form. 5 of 7 Beat together remaining 1/4 cup sugar and yolks until thick and ribbons form, about 5 minutes. Dissolve espresso powder in very hot water in small cup; add to yolks with vanilla and almond extract. Beat at high speed 2 minutes or until thickened and light colored. Stir one-fourth of beaten whites into yolk mixture. Sift one-third of flour mixture into yolks. Fold into remaining whites; then fold in remaining flour mixture. Turn into prepared pan, spreading evenly. 6 of 7 Bake in 350 degrees F oven 15 minutes or until top springs back when touched. 7 of 7 Sift remaining 2 tablespoons cocoa over cake; cover with clean kitchen towel. Invert baking sheet on top; invert to unmold cake. Remove pan, then paper. With serrated knife, trim 1/4 inch from long sides of cake. Starting from a short end, roll up cake with towel, jelly-roll fashion. Let cool, seam side down, on wire rack. 1 of 2 Sprinkle gelatin over 2 tablespoons cold water in small cup. Let stand to soften, about 5 minutes. Combine sugar, cornstarch, espresso powder and salt in medium-size saucepan. Whisk in milk and egg yolks. Bring to boiling over medium heat, stirring, until very thick, about 10 minutes. Remove from heat. Whisk in softened gelatin, butter and vanilla. Scrape into small bowl; place in larger bowl of ice water. Let stand, whisking frequently, until well chilled, about 5 minutes. 2 of 2 Meanwhile, in small bowl, beat 3/4 cup cream until almost stiff peaks form. Fold into cooled coffee custard. 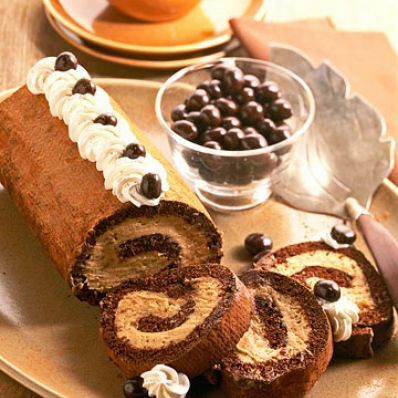 Unroll cake. Spread filling over cake, leaving 1/2-inch border on all sides. Reroll cake from short end; place, seam side down, on platter. Garnish top with additional whipped cream and coffee beans, if desired. Refrigerate at least 1 hour or until set.